Sir Alan has been in business for more than four decades. However you look at it, Sir Alan Sugar has done spectacularly well. Over forty years, he has driven himself and his company, Amstrad, from profitable cut-price hi-fi to even greater success in the early PC business, and in recent years, in satellite receivers. At the same time he has shielded himself and his family from the ups and downs of the electronics business by taking money out regularly to invest in commercial property. He shrugs off the current falling market as just the kind of 'valley' you have to expect along with the peaks of property value of the past few years. Today, in his early sixties, he is in the enviable position of owning a portfolio of classy buildings, mostly in central London, with an estimated value of about £500m. 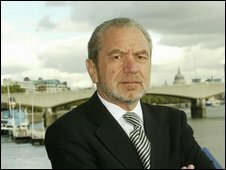 And he still has a small computer business, Viglen, selling to schools, an aircraft chartering business, and a newly-acquired advertising screen business, run by his oldest son Simon Sugar. Now he can choose just how hands-on he wants to be. 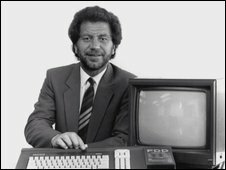 Sir Alan first found success with Amstrad computers. He has a big office near his home in Essex, but he can work just as easily from his holiday homes in Florida and Marbella, or even - using one of his four mobile email devices - up a Spanish mountainside while practicing his latest passion, cycling. He insists he'll never retire, but admits he has had enough of front-line sales work, having no time for endless Powerpoint presentations and warning that he would "end up whacking someone". Impatience has been the hallmark of his success, getting products to market faster than rivals, and keeping his hands in many pies. His long-time PR associate Nick Hewer says Sir Alan has always been in a hurry. "A 12-second phone call was the absolute maximum," he says. Colleagues say his red-hot temper blows over as fast as it appears. One common description of Sir Alan from people who know him from the prime minister downwards is that he keeps his word. Technical colleagues say it is unusual to work for someone who makes decisions fast and does not try to change them during the development process. 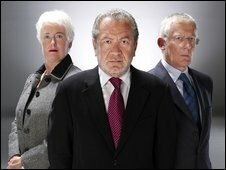 Sir Alan found fame with The Apprentice. Sir Alan's grounding in sales, traipsing round London's electrical shops selling for a wholesaler, taught him to focus on what customers want. He knew his customers well enough to market his best-selling computer as a word processor - because that was less likely to put off the still-technophobic British public in the 1980s. By the end of that decade, Sir Alan was selling to Europe, and exploring the American market. But it was the partnership with the electrical retailer Dixons, that spearheaded the company's success in Britain. Lord Kalms, former Dixons boss, credits Sugar's word processor with bringing computers from specialist shops onto the high street. But Lord Kalms also says that despite his own good relations with Sir Alan, Dixons staff found Amstrad hard to deal with. There was no fund of goodwill when Amstrad later ran into technical problems: his staff were only too happy to switch to Amstrad's rivals. Sir Alan is characteristically blunt about his own business failings, which made the 1990s much less successful than the previous decade. His time at the helm of Tottenham Hotspur was less successful. "We expanded too quickly, and we screwed up. We didn't have enough understanding of the technology as it got more complex, and I take total responsibility for that." In retrospect, Sugar says he should have stuck with products for longer, instead of relying on his old practice of pulling the plug as soon as a product's profitability began to fall when rivals entered the market. Amstrad's problems were compounded by having only half of his attention in the 1990s. The other half was on his troubled football venture, as chairman of Tottenham Hotspur. Now Sir Alan says he "wasted ten years of my life on that nonsense". 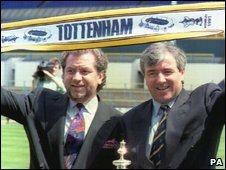 At the time, a series of legal battles - against his former business partner Terry Venables, and the press - were traumatic for him and his family. As his wife Lady Ann puts it: "I just kept saying to Alan, why did you get involved in this world? It was just awful." The past few years have been much better. He sold his football interests for a profit, was knighted ("I think I deserved it") and took on what turned out to be a hugely successful TV role in the BBC's The Apprentice. Last year he celebrated his fortieth wedding anniversary with a lavish party in his garden. Sir Alan had splashed out on the entertainment, with Bruce Forsyth as host, Jackie Mason flown in from the States to make his guests laugh, the entire cast of a West End show on his stage, and Elton John to round off the evening. Lady Ann says her husband put up with it with good grace: "Alan hates parties when they're in his honour, but I think he agreed to this one as it was for both of us." Sir Alan has always had a love-hate relationship with the glamorous world he can now so easily move in. He keeps up with old friends, and is most comfortable in his domestic life, surrounded by his children and grandchildren. The stability of that life more than makes up for any disappointment he may feel that although he made a lot of money, he didn't create an enduring electronics business. Last year Amstrad was sold to Sky for a fraction of its former value, becoming a small cog in Rupert Murdoch's media empire. Sir Alan shrugs it off: "I'm realistic. I mean what can you do? You can't keep crying in your beer." The real Sir Alan, BBC Two on 11 January 2009 at 2100 GMT. Open University - Do we need more sugar?